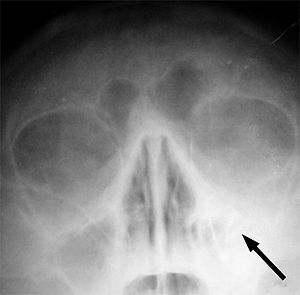 Left-sidit maxillary sinusitis merked bi an arrae. Note the lack o the air transparency indicatin fluid in contrast tae the ither side. Sinusitis, an aa kent as a sinus infection or rhinosinusitis, is inflammation o the sinuses resultin in symptoms. ↑ 1.0 1.1 1.2 1.3 1.4 1.5 Rosenfeld, RM; Piccirillo, JF; Chandrasekhar, SS; Brook, I; Ashok Kumar, K; Kramper, M; Orlandi, RR; Palmer, JN; Patel, ZM; Peters, A; Walsh, SA; Corrigan, MD (April 2015). "Clinical practice guideline (update): adult sinusitis executive summary". Otolaryngology—head and neck surgery: official journal of American Academy of Otolaryngology-Head and Neck Surgery. 152 (4): 598–609. doi:10.1177/0194599815574247. PMID 25833927. ↑ 2.0 2.1 2.2 "Sinus Infection (Sinusitis)". cdc.gov. September 30, 2013. Archived frae the oreeginal on 7 April 2015. Retrieved 6 April 2015. ↑ "What Are the Symptoms of Sinusitis?". April 3, 2012. Archived frae the oreeginal on 5 April 2015. Retrieved 6 April 2015. ↑ "Migraines vs. Sinus Headaches". American Migraine Foundation. Retrieved 2017-10-23. ↑ Adkinson, N. Franklin (2014). Middleton's allergy: principles and practice (Eight ed.). Philadelphia: Elsevier Saunders. p. 687. ISBN 9780323085939. Archived frae the oreeginal on 2016-06-03. This page wis last eeditit on 14 September 2018, at 05:36.